Dec. 3 at The Red Fox Tavern. "Blitzen what?" is the typical response you would get if you asked a handful of people about Blitzen Trapper. The next most common answer might be, "Yeah, I've heard of them. They're pretty good." You would be hard pressed to find a more passionate response. Such was the scene outside of the Red Fox Tavern on Wednesday night -- vague excitement, subdued anticipation. There were no die-hard fans there, because die-hard Blitzen Trapper fans don't exist in this area. At least not yet. Blitzen Trapper has been getting attention recently, with the well-received release of their new album, Furr, and a recent feature in Rolling Stone. The band hails from Portland, Ore., where a love for nature and simplicity abounds. This love comes across in their music. The Parson Redheads opened with an unoriginal but energetic set of ’60s-sounding rock. The Redheads are the kind of band to see at a bar, get drunk to and forget all about. Although Blitzen Trapper's creativity obviously surpassed that of the Parson Redheads, Trapper's semi-acoustic, laidback style warranted some comparisons that favored the Redheads. "The other band was way more energetic," said a bored-looking man milling about outside the venue during Blitzen Trapper's set. 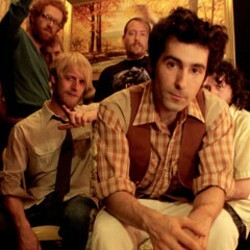 When Blitzen Trapper started playing, the song "Fire and Fast Bullets" moved the audience as an early attention-grabber. "When the fire starts falling the fast bullets fly," yelled lead singer Eric Early in a voice that hinted of barely contained insanity. But soon the band turned to the more acoustic folk-rock of their Furr album, playing their two most notable songs back to back: "Black River Killer" and "Furr," an attempt at Dylan-esque poetry describing the comfort found in simple, natural living. Throughout the show, the music was at times interesting and engaging. Harmonizing electric riffs provided for an intricate sound, and the slow acoustic songs were soothing and heartfelt. After the show, Dan Love, a local engineer, excitedly described their sound. "It's like Bob Dylan meets Led Zeppelin," he said between puffs of a cigarette. The head of security at the Red Fox, Robert Volk, was pleasantly surprised. "They drew the audience in more than most bands that come through," he said. The band did sound like Dylan and Zeppelin, but seldom in the same song. Blitzen Trapper is a band with an identity crisis -- not sure whether to rock hard, relax with an acoustic guitar, or play bouncy indie songs like "Wild Mountain Nation." The general consensus on the band was mildly enthusiastic. Everybody went home after the show, and presumably went on with their lives unchanged. There was no musical rapture.